We are pleased to announce the 2018 first round of the Vision Partnership Program (VPP) planning grants opened today (Jan. 2). 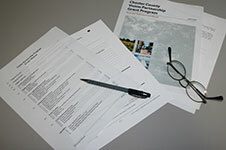 Through VPP, Chester County municipalities are eligible for funds to assist their communities with comprehensive planning, ordinance updates, and other studies. The 2018 VPP Grant Manual and application materials are available online. Pre-application meetings are strongly encouraged, and can be scheduled by contacting Planning Services Director Susan Elks at selks@chesco.org. The deadline to apply is Feb. 21, 2018. More information on the VPP process, as well as projects funded previously through the program, can be found here.